Please contact us for more information and full specifications. We look forward to showing this stunning new model. Please call 206-623-5200 and arrange for a personal showing at our Seattle office. Table - Cherry wood with a compass rose inlay design. (No warranty on exterior wood tables). Swim platform 2.5" diameter S.S. guard rails. P/H windshield cover, F/B helm cover, aft deck wind screen clear panel installed between the two stainless steel bridge support posts. Furnishings, soft-goods (bedding, towels & carpeting), dinnerware and installation costs. Electronics - Garmin 7600 series - radar, chart plotter, touch screen monitors, autopilot, Dpt/Speed/Temp, GPS, VHF radio X 2, AIS & Magnetic Compass. The Hampton 650 has proven to be another very successful pilothouse from Hampton Yachts. 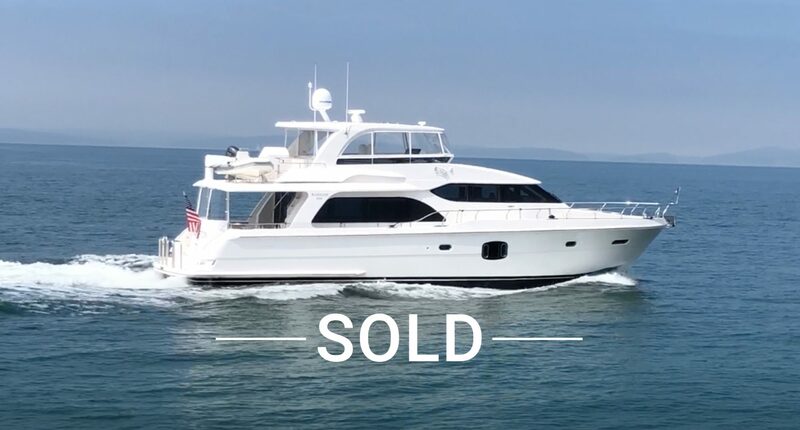 It has garnered the attention of clients whom have admired the company’s pilothouse cruiser series, but found the 680 & 740 a bit more yacht than they needed and wanted a little more room that our 580 model. The H650 with all its great features such as the covered side & aft decks, the “Full-Beam Owner’s suite” and the spectacular open salon & pilothouse arrangement combine to make the Hampton 650 a great destination place where family and friends can join together for some great cruising and relaxation. “Experience the Difference a Hampton Yacht Can Make in Your Life”.